Volo is currently on sale at 33% off! 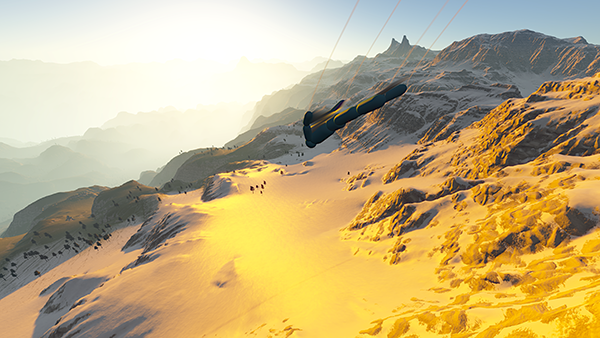 Go get some training in before we drop parachutes, multiplayer and other cool features! This entry was posted in Volo and tagged sale, Steam on November 25, 2015 by admin. It’s high time to bring the Oculus build up to date, as the previous on was no longer able to run on new Oculus Runtimes. If you’ve been itching to fly v3.5 in VR, now’s your chance! This build is based on a test version of v3.5.1, which contains some graphics changes, added environment props, and modified third person camera behaviour. The build is currently still separate from the regular builds, but we are getting closer to a situation in which VR mode can be switched while the game is running. For the time being Oculus builds will also be Windows only. It’s a shame, but Oculus are apparently only focusing on a single platform for now. Chances are the next build will be based on Steam’s VR library so the game can be played on the HTC Vive as well. Go to Betas, and select the oculus branch. Steam will now download and install a variant of the game which runs on the Rift. On some systems the game will be confused about which GPU to run on. If your game hangs on the loading screen check out this forum thread for workarounds. Ensure the Oculus Rift is reported as fully connected in the Oculus Runtime Configuration Utility. I’ve had many cases where it lost connenction, after which the game refuses to boot properly. Just replug the Rift’s cables if this happens. Certain settings are pretty awful for VR. High quality shadows and extreme quality trees can really dip your framerate, for example. Fresnel effect in shadowed areas sometimes disappears for right eye camera. I believe this is due to an internal Unity bug. Right, you’re probably wondering where multiplayer’s at! It’s progressing at a good pace, but because we’ve decided to roll out own networking layer instead of using off-the-shelf technology it’s taking sweet time. More in-depth development news soon! This entry was posted in Volo and tagged oculus rift, virtual reality on November 19, 2015 by admin.